After reading A Talent for Murder, I was eager to get back into the trenches with Mrs. Christie. 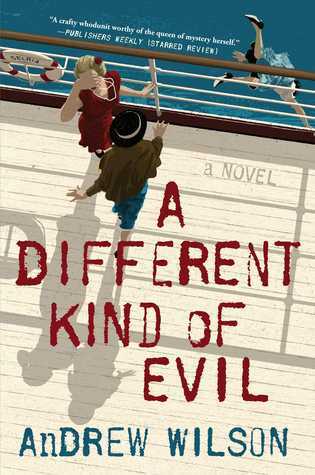 A Different kind of evil takes place just two months after the end of the first novel. I do recommend you reading it first. You may read this novel as a standalone, but I think it would increase your enjoyment of the story to read this series from the beginning. Mrs. Christie is working with Special Agent Davidson to solve the murder of his colleague, Douglas Greene, whose death was peculiar. She boards a ship heading to the beautiful Canary Islands, where Greene's body was discovered, only to find that what should be a relaxing experience is anything but relaxing. Christie is surround by a cast of interesting characters that all seem to be a bit shady at times, not to mention the suicide she witnessed a few days into her trip. Once she gets to the island, things become trickier than she thought it would be. Bodies start piling up, secrets are revealed, and even worse than that, Christie is having a hard time writing her latest novel. Andrew Wilson has created a wonderful series with one of the most beloved authors of all time. I love that he made the Queen of Mystery a character in a mystery of his own. It kind of makes you wonder where she got all her fantastic ideas for the novels she wrote. This is a great series that mystery lovers will enjoy!